Warm weather whets the appetite for light, healthful seafood. And with meticulously managed systems of logistics in place, long-standing area seafood markets provide swimmingly fresh catches abundant enough to rival most shoreline locales. From farmed freshwater trout to saltwater mollusks, crustaceans, and cephalopods (yes, octopus, we’re talking about you), local consumers can jump into a diverse pool of aquatic fare that extends far beyond tasty-but-predictable salmon. Richard Cox, who operates Chestnut Street Seafood in Emmaus with business partner Carl Strauss, reports that an annual uptick in seafood interest—especially clams—starts Day weekend and continues through fall. “Clambakes are hot,” he says. To meet this need, littleneck clams for steaming are kept in plentiful supply, both farm-raised and wild. “Wild clams tend to be a little bigger and more expensive,” he reports, adding that shellfish must come from an approved supplier. “The bags are inspected and tagged, and if they’re over 40º F they have to be rejected.” To enjoy clams raw on the half-shell, Cox suggests the larger top-neck clams—and notes that any opened or broken clams should always be discarded. Soft shell crabs offer the quintessential taste of summer. 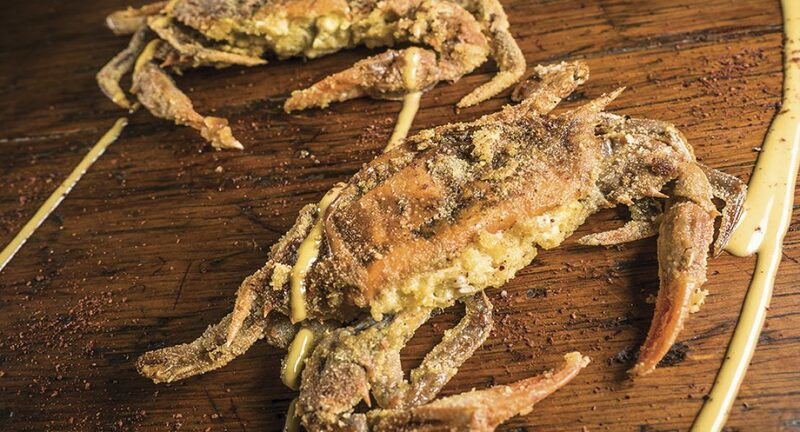 For many seafood connoisseurs, soft shell crabs offer the quintessential taste of summer. The availability of this often-fleeting delicacy—blue crabs, most famously from the Chesapeake Bay, that have shed their hard exoskeletons and are eaten in their entirety, little legs and all—is dictated by many factors, from weather conditions and moon phase to predation by other sea creatures. The supply may linger into early October or dwindle in August, so grab them while in stock. Grilling, sautéing, and deep-frying in a light breading or batter are equally simple and delicious preparations. For an elegant entrée, cook soft shells in a garlicky scampi sauce, or build a memorable sandwich by piling a crisply fried crab with sliced tomato, leafy greens, and homemade tartar sauce on a rustic ciabatta roll. In SouthSide Bethlehem, Lopes Seafood & Mini Market, owned by brothers Fernando and Albano Lopes, caters to ethnic cuisine demands for whole fish. Brightly colored red snapper, porgies, tilefish, and more are sought by a diverse clientele that includes customers of Portuguese, Greek, Italian, Hispanic, and Asian heritage—and just plain adventurous eaters. For a super-quick Portuguese meal, Fernando recommends rubbing whole sardines (about 6” in length) with salt, placing on the grill and charring each side for two to three minutes. Less common seafaring options include conch, which is fabulous in fritters and stews, and octopus, great for grilling, braising, or simmering and slicing tentacles into a cool Mediterranean salad. Both products are cleaned, reducing the “ick” factor of handling unfamiliar sea creatures. And the flavor reward will be obvious from the first blissful bite. So go ahead, make this the summer to come out of your culinary shell and dive into deliciously bountiful waters. Summer’s all about cooking techniques that keep your house cool and fresh—so forgo frying fish in a pan and stick to these more seasonal methods. In steamy weather, beat the heat with ceviche, a chilled Peruvian seafood salad featuring fish “cooked” solely from the acidity of a citrusy marinade. Look for fluke, aka summer flounder, or other ocean white fish for this easy appetizer. Fish that are great for rubbing with oil and tossing right on the grill include steak fish such as tuna, swordfish, and mahi-mahi, and finfish such as flounder, haddock, and cod. More delicate cuts of these and other fish can be wrapped in heavy duty foil with accompaniments such as lemon and butter and “baked” in a closed grill. No grill? No problem. For a beautiful presentation that further celebrates seasonality, bake individual portions of fish, like halibut, in parchment packets (en papilotte) with garden-fresh cherry tomatoes and herbs.